For once, here’s a spider with a cool name that doesn’t kill and eat other animals to survive. 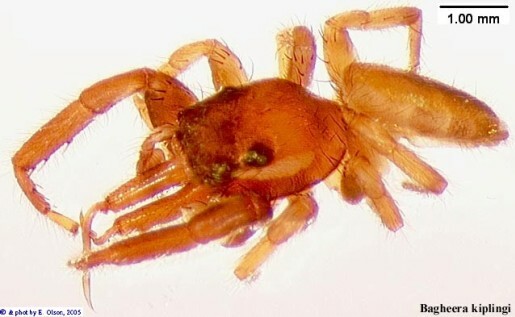 The Bagheera Kiplingi, a yellowish spider from Central America and southern Mexico, is the first known species that survives mainly on a diet of plants. The Kiplingi feasts on the Beltian bodies located in the leaves of the acacia plant. The interesting fact of the B. kiplingi isn’t that it was named after Rudyard Kipling and his famous panther Bagheera, it’s that scientists have been studying the relationship between the acacia plant and the ants that live inside the plant for years, yet nobody noticed this spider that bypassed delicious ant meals in favor of little bits of leaf, pollen, and nectar. Well, normally, anyway. This lightning quick spider prefers to avoid combat rather than lower itself to capturing prey in webs. The speed and dexterity is incredible for a creature with so many scuttling legs.